Her fifth album release, Tracey K. takes a step back into the Rockabilly field with these exciting, toe-tapping songs, sure to get you up and dancing. Featured guest artists are James Intveld and Marti Brom, both of whom lent their writing and vocal talents to the album, with James contributing on piano as well. 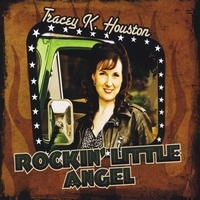 "TRACEY K. HOUSTON - a very dear friend for several years, is a beautiful and very talented female vocalist of old school country and rockabilly music who should be at the top of the charts today, and will be in the future with this new and brilliant CD. You will hear the special and versatile style she gives to this new rockabilly performance in the most unique and spicy ingredients she puts into this new album. You will hear and feel the dynamics, and will truly know that Tracey K. Houston is the angel that knows how to rock. Best Wishes Always Tracey. Your friend -- Carl Mann."